A few months ago, Tony and I were yuppy-ing it up listening to NPR when we heard a fascinating program on discount stores and the death of craftsmanship. Naturally our ears perked up as we heard person after person phoning into the show to talk to Ellen Ruppel Shell, the author of the book Cheap: The High Cost of Discount Culture, about their experiences as small business owners and craftspeople competing with big box chain discount stores. It most certainly struck a chord with us, since like a lot of people we know, we are making a living by our sorely undervalued craft. I ordered the book from the library, and two months later, I finally got to read it (clearly lots of other people heard the program, too). Just how did we get stuck in a vicious cycle of buying increasing amounts of inexpensive goods that are ill-fitting, easily broken, and designed not to last until next Tuesday, let alone next year? 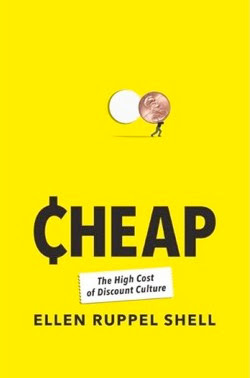 Cheap helped to answer many of my questions about why craftsmanship and small business has become undervalued in our country (and abroad), and why it is so hard for us all to break off what Shell, a professor of journalism at Boston University, calls our "dangerous liaison" with cheap goods. Shell relays the history of the discount, from the first Woolworth's to the invention of the price tag, and how the so-called great businessmen of the early 20th century began to de-skill and therefore underpay their (often female) employees in the name of profit and "democracy." She explores the psychology of the "bargain," and how the receptors in our brains work against us in the heat of the moment in front of a stack of ten dollar shirts at H&M. For me, the most interesting part of the book is the chapter devoted to IKEA, "The Death of the Craftsman." Oh, IKEA. It's so hard to stay mad at you, but I'm determined to try after reading this book. How many of us have Billy bookcases, Not lamps, and Nikkala sofas sitting in our homes right now? And how many of us have eventually put these things out on the street before going back for $1.99 meatballs and a new set of shelves? (Raises hand with guilt). As a small business dedicated to restoring and redesigning furniture that already exists, Chroma Lab is the polar opposite of IKEA, the number three consumer of wood on planet Earth. Their products, as Shell points out, are designed to be set out on the curb so that you can come back for more meatballs and get next year's model at an even steeper discount, with no guilt about what you've left behind. This is not sustainable for our planet or for our wallets, and it does nothing to connect us with the skilled people in our community that earn their living by offering a beautifully designed, higher quality product that you would never dream of setting out on the street (a-hem, a-hem). If you're at all interested in craftsmanship, sustainability and what the true cost of a $3.84 two pack of underwear is, then I highly recommend picking up the book Cheap. Now if you'll excuse me, I've got some things to return to H&M. Well said and written!! I really hope Americans wake up to all of this some day. The sooner, the better!